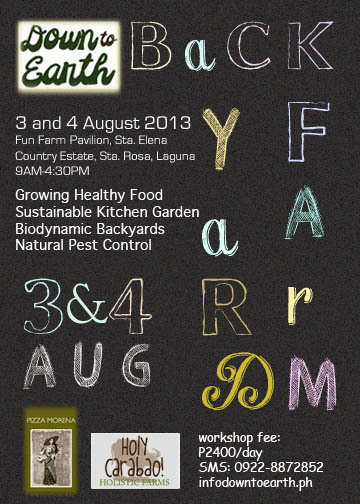 Backyard Farm | Our Farm by Earth Flora Inc.
FROM SLEX / SOUTHBOUND: Exit Cabuyao / Sta Elena. After tollgate, make a right. About 500 meters is the Sta. Elena Village Gate. Enter there and follow the sign to the Fun Farm. FROM TAGAYTAY/STA ROSA ROAD: Make a left into Sta. Elena City (it is before Nuvali). You will pass Fontamara homes, Mesa Homes, Augusta, then you will reach Georgia Club Rotonda. Make right at the Rotonda. It is a long road. You will see walled communities such as Belle Reve on the right. At the end of the road is another Rotonda, make a left. Follow the long road until you see the Sta. Elena gate on your right. Enter and follow the sign to the Fun Farm. PUBLIC TRANSPORT: Take the bus to Balibago, then take a tricycle ride from Sta. Rosa exit (tricycle terminal) to Sta. Elena City. 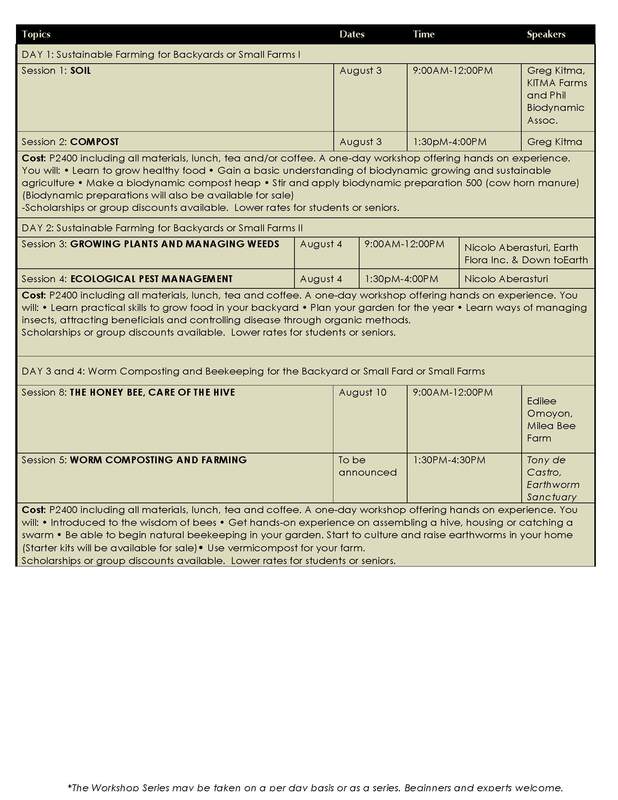 MEALS: All meals are included in the workshop fee. Healthy yet scrumptious meals made of local, organic or sustainable ingredients will be served by Pizza Morena by Jenny Burns. Please bring your own water bottles, plates and utensils. If you have any food allergies or preferences, please inform us so that we can discuss how your food needs can be met. *Scholarships are available. We have installment options too.